We’ve already seen this same device leak a few weeks ago. We saw an Alcatel device with the model number: 6060. We are seeing the same model again, but this time there are some peculiar differences. While the previous Alcatel 6060 leak had a Snapdragon 625, 3GB of RAM, and an Adreno 506 GPU, this new device shows a Mediatek Helio P20, 2GB of RAM, and a Mali-T880 GPU. A 12MP main camera capable of 4K recording and an 8MP front facing one. There’s also a 5.2-inch 1080p screen. But what’s peculiar is that both of these result pages show different versions of Android. The prior device (with an SD625) is listed running Android 7.1.1 while the latest result shows a version of 7.0. This could mean the company is testing both versions of the software and could ultimately pick Android 7.0 if the 7.1.1 build isn’t quite ready yet. 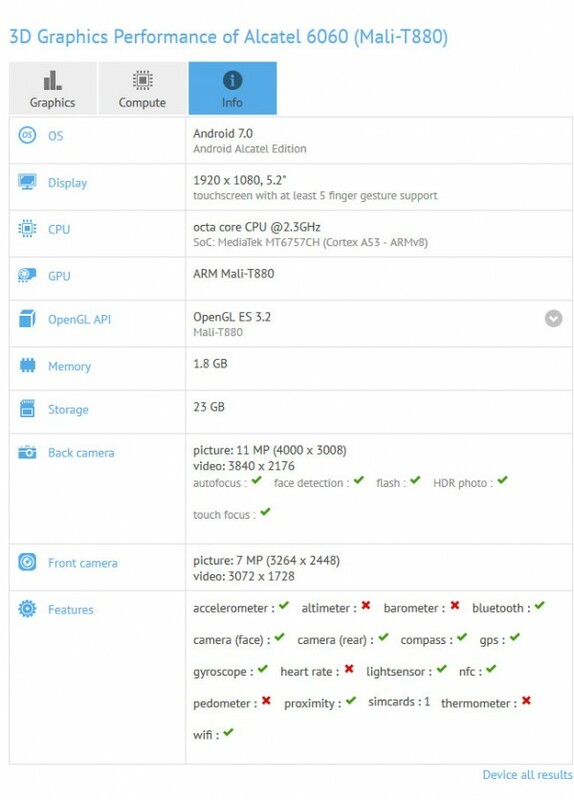 We can speculate that there may be two variants of this unreleased Alcatel device (which we think is the Idol 5(S)) one for, presumably, the US market while the MediaTek version would see other markets. In meantime, check out the leaked live image of the alleged Idol 5S next to the Idol 4 from a couple of weeks ago.